"The Mobile Farm has become an excellent attraction as part of our annual Green Fayre show at Beacon Country Park. From start to finish Ben and his team are friendly, well-organised and a joy to work with. The two-trailer setup is perfect for our show and can handle large numbers of visitors in an effective and safe manner. The kids (both young and old) love the attraction, the variety of animals is excellent and the staff are both knowledgeable and friendly when dealing with all age groups. Our show would not be the success that it is without high quality displays such as this"
"The two ladies were just lovely, Marion was in charge and was just so friendly and welcoming and really encouraged the children to get involved, even when at first some were apprehensive." "It was well set up and the animals were very friendly. The two staff spoke to the children at the appropriate level and gave them a lot of information. They answered some very excited children’s questions patiently and informatively. They coaxed any nervous children to overcome their fears. "The nursery children loved meeting the different animals. 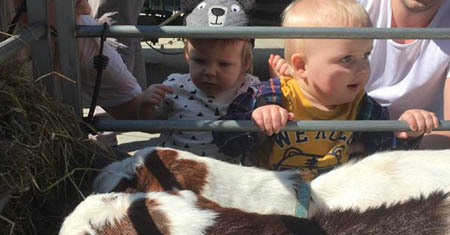 It gave the children chance to touch a variety of animals in a small group setting that may not have been feasible on an actual visit to a farm. The process of booking the farm and the actual setting up and clearing away on the day was extremely efficient." "We thoroughly enjoyed the day - the children are still talking about it now and it was the highlight of a very successful outdoor learning week. Thank you also to the staff for their positive feedback on the children and staff. The time allowed at the end of the day for the parents to visit the farm really finished the day off, the support from the parents was great and the staff were helpful, friendly and informative. Thank you, we hope we can see you again soon!" "The staff were excellent and well prepared. They were very patient with our children and allowed the school to run smoothly with very little interruption. Parents report how much they enjoyed learning about the animals." "This was a wonderful experience for our 2-4 year olds and they all absolutely loved it! Every child was able to see, touch and find out about a broad range of farm animals close up. The information given was perfectly tailored to the age group. The animals were so gentle and docile that even the most timid children were joining in and stroking them by the end of the session and thoroughly enjoying it! I will definitely book the mobile farm again and recommend it to other schools and organisations." "A lovely visit once again from the Mobile Farm. The children really enjoyed having the opportunity to see and touch the animals they have been learning about this term. The staff were very approachable and full of interesting bits of information about the animals to ensure the children were engaged!" "Thank you so much for adding to such a wonderful day. All the families loved having the mobile farm at our family fun day; the staff were very accommodating towards our children’s needs. We can’t wait to see you again!" "The team onsite were very well prepared and efficient when adapting the set up to the space available. All visitors on the day loved meeting the animals and learning about each of them." "Farms are a magical place for children – but also for adults – as Mobile Farm’s wonderful “Farm for a Day” event proved: they supplied a day of happiness and excitement for every member of our school. Professionally run and expertly delivered, the day was a hugely positive experience for all of our pupils and staff: the Mobile Farm staff answered questions patiently and explained animal facts at a wide range of levels – our children were entranced and learnt so much. An added benefit of this superbly organized Mobile Farm that we hadn’t foreseen was the huge boost to everyone’s mental well-being: as our pupils handled and discussed the animals under the guidance of the Mobile Farm team, you could see them visibly relax as they processed the new information and emotions they were experiencing in the open air. What a lovely treat – thank you so very much for bringing so much joy to our school for the day." "Thank you so much for today. I'm so glad I booked you. All children were utterly thrilled with the animals! Such a brilliant party thanks to you." "Just wanted to say a massive thank you for yesterday. All our women loved it & have been talking about it all day & night. They were quite captured by the rabbits. The ladies were very knowledgeable & we all learned new things. Give our love to Catherine the sheep. Once again thank you for an amazing day"
"Thank you very much for bringing your Mobile Farm to Weaver Vale (26th and 27th November) You gave us a lovely selection of beautifully looked after animals. Your team were very professional, enthusiastic and full of great information for our customers. The children loved the animals. I hope your team enjoyed the two days with us." "I just wanted to let you know that we were absolutely over the moon with the party on Saturday. Marion and Ben were fantastic and Claudia and Imogen had the best time. We have held quite a few parties over the years and this was by far the most enjoyable. Thank you and please pass our thanks on to Marion and Ben." "Thank you, we found the whole experience very worthwhile for our children. Everything went really well and it was lovely how friendly the animals were, this made it so easy for the more reluctant children to stroke the animals even though it was a new experience for many of them." "Just sending this email to say a huge thank you from us all at the Willows. The children, staff and parents have all been totally blown away by your visit today! The staff and animals were amazing and we definitely look forward to seeing you again soon." "Thank you so much for providing a fantastic day and learning opportunity for our children!! All of the children really enjoyed it and they learned so much, there was a real buzz around school and even the most reluctant talkers couldn’t wait to share what they had learned with other people! " "Just wanted to say how fantastic today was!! Marion did a great job and all the children (and adults) loved it." "Thank you to Fisher’s Farm for yet another truly wonderful afternoon at the Victoria Gallery & Museum, University of Liverpool. Their third visit to us, the farm afternoons are by far our most popular family event. The families love meetings all the animals and finding out more about them from Liz, Richard and their team, all of whom are very knowledgeable and friendly. The team is extremely professional, bringing everything with them including gazebos in case of rain and handwashing facilities if requested and clearing away fully at the end of the day. Entirely self-sufficient and no bother which is just what I need on these busiest of days! Thank you once again for making our Easter event such a success and we look forward to working with you again in the future." 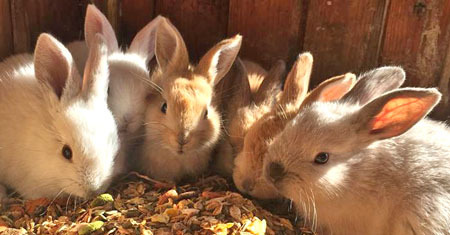 "A truly unique educational experience, a fabulous range of animals and great value for money with friendly and informative staff. A great day had by children and adults." "What an amazing start to the day for students, parents (and teachers) to walk into school and see lots of beautiful farm animals on the playground!" Just a big thank you to everyone involved in Saturday's farm experience - its hard to tempt my mum Betty Platt out but she was determined to see the animals, and it banked a good memory for me and my brother. I know Evelyn really enjoyed the day and was talking about it on Sunday- " it makes me feel human" she said, while stoking a large white duck on Saturday... tears for everyone! Thanks for letting me hold a goat too - it made me very happy!!! "The farm was well loved and a great success. The Residents really loved the chance to pet and hold various animals. We would highly recommend the farm for anyone young or old as it suits many needs." "Everything about the Mobile Farm visit was amazing. The animals were gorgeous and Liz and Richard were very professional and informative. You differentiated accordingly for Nursery and Reception and it was great that the children could wander around and satisfy their interests independently." "The visit was a great success! Your staff really made the children at ease with the animals, the children were so excited and enjoyed it immensely!" "Delightful owners and friendly, adorable animals. 100% recommended - there'll be no regrets!" "The farm visit was a huge success and they brought a wide variety of animals that the children may not have had an opportunity to see before. All ages that visited our event were positive and enjoyed the whole experience." "Thank you so much for a wonderful day and for being so lovely with the children. It was the best Infant Fun Day I have been involved in. I would highly recommend the Mobile Farm company and we will be booking them again in the future. Thank you for a fantastic day which our children, parents and staff thoroughly enjoyed!" 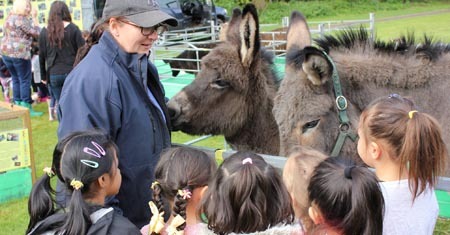 "The Mobile Farm is fantastic – our children thoroughly enjoyed seeing & learning about all the animals. The staff are great & really gave our children an experience to remember." "Marion and her husband were nothing short of wonderful! They were great with both the kids and the adults and a stressed mum! The children really enjoyed meeting the animals and were surprised at how very friendly they were! The very special day was made all the more special by the professional, friendly and thoughtful service, I would definitely recommend you to any one who ask!" "The Mobile Farm provided a fantastic ‘wow’ day for our whole school. Would definitely recommend." 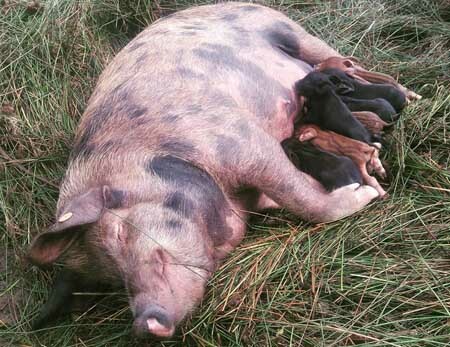 "I can recommend the Mobile Farm team for their professionalism & attention to detail. Fabulous, happy relaxed smiling animals bringing the countryside to the most urban locations!" "We just wanted to say “Thank You” for making our farm day extra exciting! The children gained so much from meeting the animals – regardless of their age or ability. I will definitely be recommending Fishers Farm in the future! "An amazing experience for the children – so well organized – the children were able to learn so much in our session whilst having a fantastic time with such well behaved animals." All the children and staff found the whole experience lots of fun as well as very interesting and informative. We thought the way it was set up like a small farmyard was brilliant. We will definitely be booking again for next year." "We were extremely impressed with your visit to our school. The whole set up was well-organised, attractive and clean, with a good variety of animals and with a canopy over our heads we didn’t even notice the wet weather. You engaged the children at their level and even some often challenging children were attentive and enthusiastic. Children who were timid to begin with grew in confidence and were happy to stroke the animals by the end. The animals were delightful – so friendly and patient. We had a very enjoyable and worthwhile morning. To look at the site afterwards no one would have known you had been there!" "It was a thoroughly enjoyable day for children and adults alike. Liz and Richard were brilliant with the children, very friendly and caring and answered lots of questions. Thank you for giving the children of Westleigh St Paul’s such an amazing experience and we will see you again next year!" "We had never heard of the mobile farm before nor knew anyone who had ever had a visit so we took a huge risk in booking it and were absolutely thrilled with the outcomes. The children were excited and motivated, the animals were clean, charming and used to being handled. Richard and Liz put over a lot of info in a short time and gave us a fabulous days experience. Money well spent and 100 happy children!" "A fantastic experience for all the children in our school, from Nursery to Year 6. It really helped bring alive our Traditional Tales unit of work and the children's enthusiasm and writing reflects this. The whole event was well organised, from the website to the day itself. Well worth it. I will be booking them again next year." "Thank you Liz & Richard for a fantastic day packed full of exciting learning opportunities! Both the staff & the children at St Kentigern’s RC Primary School enjoyed meeting you & getting up & close with the animals. We would highly recommend the Mobile Farm to all schools & we hope to see you again next year for another visit." 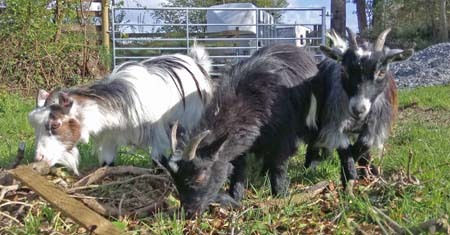 "The Mobile Farm provided the children (& staff) with a most enjoyable experience. We would recommend you to other schools. "We had a fantastic day with the mobile farm. All the children (& the adults/staff) thoroughly enjoyed the experience. Everything was well prepared & everything went to time. "As part of our ‘Down on the Farm’ themed week in June at Burnley Brow Primary School (Oldham) I booked ‘mobilefarm.biz’ for 3 days & I couldn’t have been happier with this choice. Right from the start, the staff were fantastic. The farm was well organised & clean, & the varieties of animals were friendly, happy & obviously well cared for. The farm staff led brilliant sessions with small groups of our children, asking them questions & engaging them with interesting facts about the animals. The children were encouraged to touch the animals & to have their own questions answered. The variety of animals was impressive, as was the amount of display & information boards around the farm. Children from Nursery through to Year 6 visited the farm & all were completely engaged in their visit. The older children were challenged with their knowledge about farming & farm animal use & all came away knowing many new things, & for the younger children it was probably the first time they had seen such animals. There was a real buzz for learning around school during this theme & this fantastic farm made this all possible. I would highly recommend to any school for any age." 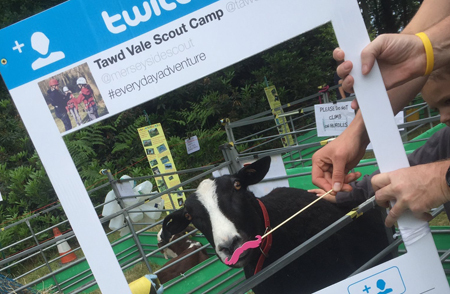 "500+ Rainbows from Lancashire North West enjoyed an "Animal Magic" Day at Guys Farm Activity Centre. The highlight of the day was the visit by the Mobile Farm. Every girl & leader had the opportunity to get up close & personal with their favourite animals. They absolutely loved it! Thank you to Richard & his team who were so helpful, efficient & friendly & contributed to an amazing experience. They all left tired but excited & happy after their animal magic experience." "Fishers Mobile Farm is brilliant, the staff that come along are brilliant & very informative for the children. I would highly recommend the farm to any school or nursery." "We used the mobile farm for one of our Easter holiday clubs. 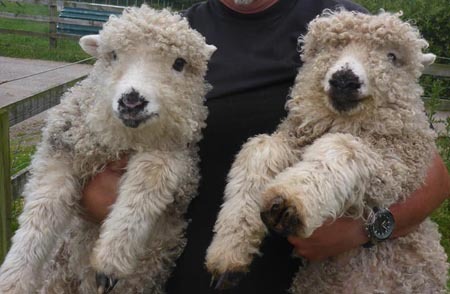 Staff were friendly & helpful & the animals were treated respectfully & kindly. We had a range of children from 0 - 11 years. 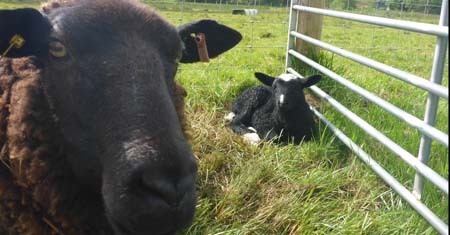 The farm was appropriate for all ages & the feedback from parents was great. "Thanks for making our Spring event in Oldham town centre such a great success. Kids & adults loved the animals & you were a pleasure to work with. Hope to see you all again soon." Just wanted to say a huge thankyou for the amazing day with your animals. You even arranged the sunshine! Brilliant! The staff were delighted & the children made comments like "It was the best day of my life!" Hope to see you again at the Valley. (PS. Thanks for clearing up the field.)" "Thank you to Liz & Richard for such an exciting day. The children & staff from The Friars Primary School loved meeting all the beautiful animals & experiencing such positive interactions. The day was really well organised & enjoyed by all. We hope to see you again in the near future. PS. The one little boy who had the calf leaning on him has not stopped saying 'That calf loved me, that calf really loved me!' He has told everyone!" "The mobile farm visited our foundation stage for a day last week. It was absolutely amazing! The farm staff had a lovely manner when talking to our children & the animals were very tame & happy to be stroked. It was a wonderful experience for all of our children & I'm sure that they will never forget it! We invited parents to join us & the feedback from parents has been fantastic. It was an enjoyable to day for children, staff & parents. The mobile farm staff were friendly & accommodating & they made time for ks1 to visit the animals as a whole key stage over lunch time to make the most of every second of their visit! I could recommend the mobile farm to any school & I hope that we get the opportunity to invite them to visit again in the future"
Just wanted to thank you again for such a brilliant day. The kids & adults loved it – I was amazed at how many brought their parents after school! The feedback from everyone was amazing. I will be telling colleagues about you & spreading the word of Fishers Farm!! Can you please tell me are there any upcoming events similar to this that you have planned? We live in Crosby but I would travel into Cheshire or Lancs if I could reunite Jenna with your duck! "Wow! What a fun day! The children & staff thoroughly enjoyed your visit. It was such a pleasure welcoming you all to St Philip's! From the minute we first made contact to the end of the day your organisation, patience & attention to detail were superb! Many thanks for helping to make 'Eartha's Special Day' such a huge success." "We just wanted to say a huge 'Thank you' for helping to make our Super Science Day a huge success. The Mobile Farm was loved by all the pupils & staff! Thank you again"
"Thank you so much for a great day. The children thoroughly enjoyed meeting all the lovely farm animals. The younger children who visited the animals in the morning could talk about nothing else all afternoon. At lunch time today several of the older children came up to me to thank me for organising the visit. 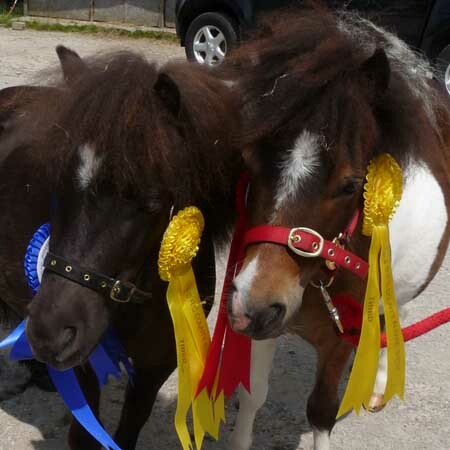 Your animals were very well behaved & I hope all of our children were well behaved for Richard!" St Edmunds Primary School, Miles Platting. "Thank you for a great visit from you & all your animal friends. The children have a fantastic day & haven't stopped talking about it since. We've had great fun looking at all the photographs taken on the day & are still amazed at the patience & gentleness of the animals that the children were able to interact with. The visit has inspired the children to produce some fantastic follow up work & generated lots of discussions. We will definitely be in touch again to book another visit from you in the future." "Just wanted to say many thanks for your visit today. I know the children gained such a lot regardless of their age or ability. It was especially lovely to see & hear the 'quieter' children talk so much & show excitement & pleasure"
"Thanks Liz. We had a fantastic time (again!). The children couldnt stop talking about the afternoon especially Eric & Ernie." "Thanks to everyone for a great weekend here at High Legh Garden Centre. Our visitors (& staff!) had great fun with your wonderful animals. They really made the weekend for us. Hope to see you again." "We had a fantastic time & all the staff & the children loved the experience. We will definitely be wanting you to come again next year. Thanks again it was a brilliant day." "Thank you for a wonderful morning. The children all had a brilliant time, & we can't thank you enough for everything you did." "We all thought that the farm was a wonderful experience for our children & gave rise to lots of activities after you had left." "...can't believe how much it meant to us having your mobile farm - our kids (all on the autistic spectrum) - just absolutely loved EVERYTHING. A huge thanx for allowing our kidz to experience it." I just wanted to say thank you again for yesterday. You were all so lovely & helpful. Pass the parcel with a goat! It just doesn’t get better than that! Jack had such a good day & when we got in the car to go home he asked if he could have the same party again next year! Jack wanted to sleep in his t shirt & has told me how to wash & iron it about 6 times so I don’t spoil it!! 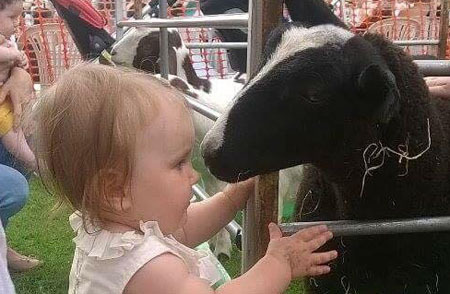 "....all the children really enjoyed the Mobile Farm & meeting all the animals – it was a lovely attraction for our Fun Day." "Thanks for coming along to Playday, I really thought your farm was a great addition to the event." "Thank you so much for coming to our setting today. The children have all enjoyed having this hands on experience." "Thankyou for our visit last week. Perfect for our children. Will def ask you to come again." may I take this opportunity again to say thank you for bringing your animals to our school last Friday. The children (& adults!) had a wonderful time & are still talking about it now. I think Buttercup was the most popular & loved by all. Personally I loved the ducks & enjoyed getting so close & stroking one. Thank you once again & we hope to see you & the animals again soon"
They [the photos] look fantastic, it's a wonderful memory of a fabulous day. In preschool we had Ofsted that day who visited the farm with one of the groups & he loved it. By the end of the day we were judged to be outstanding in every area of our provision. So our farm day will always be very special to us. We hope to see you again in the future." "Thanks liz & all of our special guests for making Dillon's birthday party truly memorable. Had a fantastic day"
all the tenants & customers loved it, they found it really interesting & enjoyed the fact the animals were so tame they could stroke them." "Hi Liz….. we thought it was fantastic & will defo be booking again. The parents, children & staff all thought it was brilliant …….. a very professional, friendly service. "Fabulous Mobile Farm. loved Buttercup the Jersey calf. Great experience for the children. Definitely host a visit again. Thankyou." We bring our farm to you - significantly less expensive than transporting your groups to the farm!